Let’s face it, you want a truck for several reasons, but one of the biggest ones is because you want to be the person everyone turns to when they need something moved. Maxed out on space and style, the Toyota Tundra is a great option to help your college roommate move around the Whitestown area or to bring home the nursery furniture for the newest addition to your family. 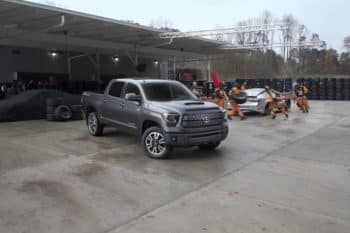 At Andy Mohr Toyota, we have a lot full of brand-new 2019 Tundra models, as well as some 2018 leftovers that incentives may lure you into buying. If you’re more of a used vehicle kind of a person, you’ll find plenty of variety in that department as well, so you should have no problem finding the right truck. With barely above 3,000 residents, Whitestown exemplifies small town charm and offers some excellent dining choices, quaint shopping locations, and plenty of activities to engage in in the next town over. Zionsville, just five miles away, offers wineries, a nature center, a fantastic ice cream shop, and a fully stocked Farmer’s Market. 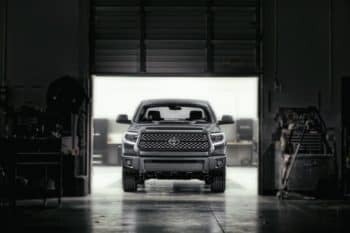 Available in six different trim levels, you’ll have plenty of options when it comes to making your new Tundra your own. The standard engine is a 4.6L i-Force V8 that offers up to 310 horsepower, however there is also a 5.7L i-Force V8 that is capable of reaching 381 horsepower. In addition, your Tundra comes standard with an Entune® App Suite audio system, two 12V outlets, and the addition of Toyota Safety Sense™. This revolutionary technology features Pedestrian Detection, Lane Departure Alert, Sway Warning System, Automatic High Beams, and Dynamic Radar Cruise Control, all of which work together to prevent collisions. Here at the dealership, we have dozens of Tundra models, both used and new from which you can choose. We urge you to make a list of your desired features and then use those special options to narrow down your search, either here on our lot or on our website. You’ll find our entire inventory available online and you’ll find detailed descriptions of each vehicle and a CARFAX® Vehicle History Report™ on our used models. When you come to the dealership, you can have several models in mind you’d like to take for a cruise or ask some additional questions about. The first step in obtaining the proper financing for your vehicle is to fill out our financial application online. This gets our team started with reaching out to our lending institutions, for both buying and leasing your next vehicle. Should you wish to keep things short-term, keep your payments lower, and be open to some great deals, then leasing is the best option for you. However, if you look forward to owning your car at the end of the finance term, then we would recommend traditional financing. Our vast network of lenders can find the rates, payment amounts, and loan lengths that work for you. 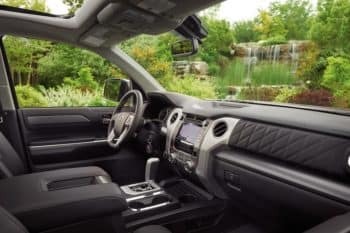 When you’re ready to get behind the wheel of your next vehicle, the Tundra is an excellent choice for all your needs in the Whitestown area. At Andy Mohr Toyota, we’ll help you find the right truck, make the right financing decision, and take you on a test drive.